Diving is something that is always evolving, improving and changing through new technology, training and experiences. 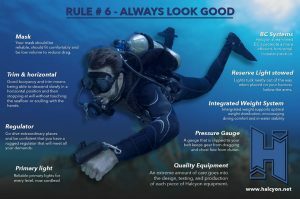 The concepts we implement and the way we think of posture, trim and technique gets taken to a new level of excellence as the average recreational diver has typically not been taught anything about trim, posture, streamlining themselves in water, or simplifying the equipment configuration. This course teaches streamlining with gear for example how to get rid of hoses that are too long or too short, as well as to provide the diver with knowledge of why the hoses are improper size, why we utilize a longer primary regulator hose, as well as removing all the “danglies” off their equipment and creating a sleeker, more efficient diver profile. This stand alone Workshop is only $85+HST. For Divers of ALL Skill Levels beginner to Instructor. Want to know more about NAUI NTEC a Modern Equipment Configuration & Foundational Skills Workshop?